This cover story by UCSC graduate student Henry Houskeeper was recognized with a statewide award for environmental reporting. Cover image courtesy of Good Times. 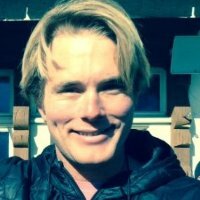 Henry Houskeeper, a UC Santa Cruz graduate student in ocean sciences, has received a statewide news reporting award for a class story about the threat to mountain lions posed by mercury from the ocean. 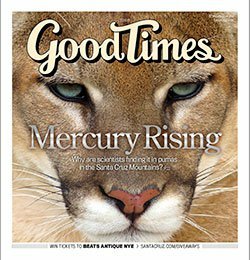 The article, "Tracing the Elements," was published as a cover story in the December 16, 2015 issue of Good Times, a popular weekly publication in Santa Cruz County. Houskeeper's piece received 2nd place in the environmental reporting category for large weekly newspapers from the California Newspaper Publishers Association in its Better Newspapers Contest 2015. The story describes research by UCSC toxicologist Peter Weiss-Penzias and his team on mercury-laden fog along California's central coast. The team is examining possible impacts on the ecosystem as a toxic form of mercury, called methylmercury, escapes from the coastal ocean via fog. It then accumulates in trees and animals in the fog-shrouded Santa Cruz Mountains. The mercury comes originally from exhaust, factories, and other industrial sources. The team has found especially high concentrations of this mercury in the whiskers of resident pumas, raising concerns of another threat to a species already hemmed in by roadways and development in its once-unbroken natural habitat. Weiss-Penzias and his colleagues collaborated with the Santa Cruz Puma Project on the work. Houskeeper wrote the article in spring 2015 for Introduction to Science Writing, a course taught annually by Science Communication Program director Robert Irion. The course enrolls juniors and seniors in the sciences at UCSC who are interested in public outreach or who simply wish to improve their writing and communication skills. Houskeeper took the course as a first-year graduate student. He has since published another cover story in Good Times to continue developing his interests in reporting and writing about science. Weiss-Penzias and his lab group recently produced an explanatory video on YouTube about how mercury cycles from ocean to land through the fog.